Think your financial advisor is conflict-free? Think again. You probably expect your retirement advisor or financial advisor to have your best interests in mind, right? An advisor is like your attorney or doctor: promising to take care of you and be your partner through thick & thin. I mean, you’ve entrusted them to guide you through the byzantine maze of retirement and financial planning, so how can they not be 100% trustworthy and on your side? Jason Zweig in The Wall Street Journal researched 70 advisors with LPL Financial Holding in Boston. LPL claims on their website to “provide truly objective, conflict-free advice and investment recommendations.” However, when LPL had to register with the government (LPL legally needed tell the truth to the SEC), suddenly the “conflict-free” story changed to “may earn more when clients invest in one product or service than in another.” Translated: advisors may get a commission on what you buy or invest in. “Under our current system, your advisor can accept a back-door payment or hidden fees for directing you toward a retirement plan that’s not in your financial best interest. And it’s completely legal”, as explained in a report done by the Obama White House (President’s Council of Economic Advisors). Typically, conflicts arise because the products you buy (stocks or bonds) or how much money you have with the advisor directly affects the advisor’s compensation. If the advisor is fee based, they sometime take a higher commission if you buy one mutual fund over another. When an advisor is paid based on the percentage (average 1%) of your money they manage, the advisor makes more money if they are managing more of your money. If you pay off your home, the advisor will have less of your money to manage and, thus, they will make less money. In other words, the advice the advisor gives, and whether or not you take it, directly impacts their compensation…a potential conflict of interest. But, I want to keep my dimes…. Ben Steverman at Bloomberg notes, “Many financial advisers just don’t care what’s best for you. 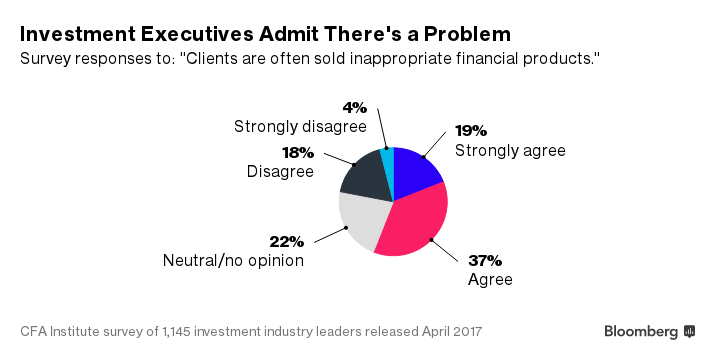 But with an industry awash in misconduct, the bigger issue may be that they aren’t required to care.” This has resulted in an “estimated $17 billion a year [loss] to conflicts of interest among financial advisers” — and $17 billion isn’t chump change. Don’t think you have a bad advisor? An academic report claimed “at some large firms, more than 15% of advisers have records of serious misconduct” and retirees are more prone to predatory behavior. It gets even more scary. The report states, “Some firms ‘specialize’ in misconduct and attract unsophisticated customers.” Firms built around “misconduct”? “Clients very rarely know what’s going on, or what it’s costing them,” claims a Cerulli Associates survey last year. And it is costing people a lot, especially those in their 60’s and 70’s. 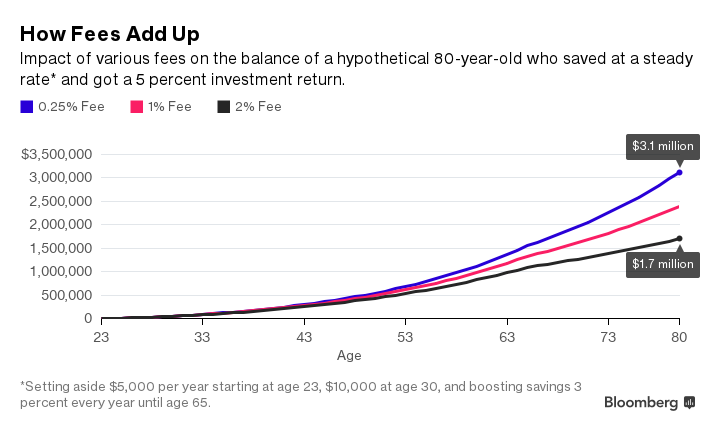 Just look at how fees add up over your lifetime. $3.1 million vs $1.7 million is not a small amount of money to lose to fees. Paul Smith, chief executive of the CFA Institute, nicely summed up the issue: “Everyone knows we overcharge for what we do. It’s obvious.” Investment executives even admit there is a problem, as the chart below shows. The state of the rule is far from certain as Denise Valentine, author on a reporton the Fiduciary Rule, notes. The Trump White House is currently debating the rule to determine the Rule’s value. “Focus not only on how the advisor is getting paid, but also the all-in costs associated with their strategy, such as fund expense ratios, trading costs, and taxes,” recommends David Oransky, CFP® and financial planner at Laminar Wealth. While having a retirement or financial advisor seems perilous, especially before the new Fiduciary Rules is enacted, there are alternatives. Ben Steverman found that “technology makes it possible to provide advice to more people more efficiently.” He is referring to “robo-advisors” such as Betterment or Wealthfront. These sites focus on automatic investing and use computers to make investment decisions on your behalf. Unfortunately, they have little in regard to advice and planning outside of investments, such as estate, medical, or retirement planning. However, if your primary concern is where to put your money, these robo-investors can be an excellent choice.